From New Zealand’s largest city to its geothermal heart, this five day road trip covers some of our must-do spots that you should include in your New Zealand Itineraries. A family road trip from Auckland to Rotorua will take you to a volcano, hobbit holes and glowworm caves, and zipping through ancient trees. There is so much to see in Auckland, but many explore beyond the city borders to see the rest of our beautiful country. So this Auckland-Rotorua itinerary suggests spending one day in our largest city to see some of our favourite sights. First, begin your day with a ferry crossing across the Waitemata Harbour. In 25 minutes you'll be on Rangitoto Island, one of the city’s 48 extinct volcanoes. An easy climb through pohutukawa trees and lava fields gets you to the summit where you can enjoy panoramic views. 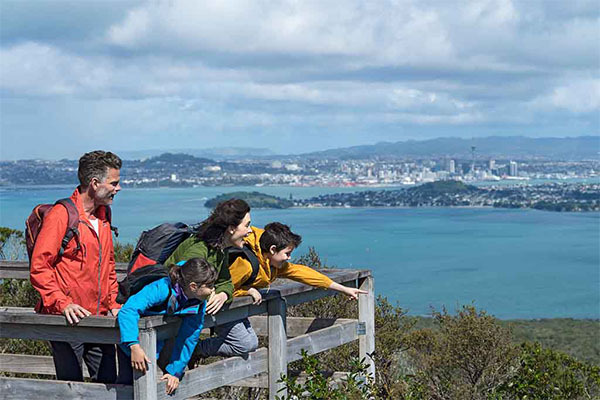 We highly recommend going up the Sky Tower – another of the city’s popular vantage points and a hit with all ages. In west Auckland, take your pick of the black sand beaches. These are popular with both locals and visitors for their surf and views. Piha, Muriwai (home to an impressive gannet colony), Karekare or Bethells - there are many choices. End your day with fish and chips on the beach watching the sun go down over the Tasman Sea – simply stunning! Journey through an array of farmland, lakeland and forest on your way to Waitomo Caves - south of Auckland. The Waitomo Caves region is renowned for its underground wonders, including an extensive limestone cave system. You’ll find stalactites, stalagmites and glowworms suspended from the cave ceiling, all accessible on easy walks. 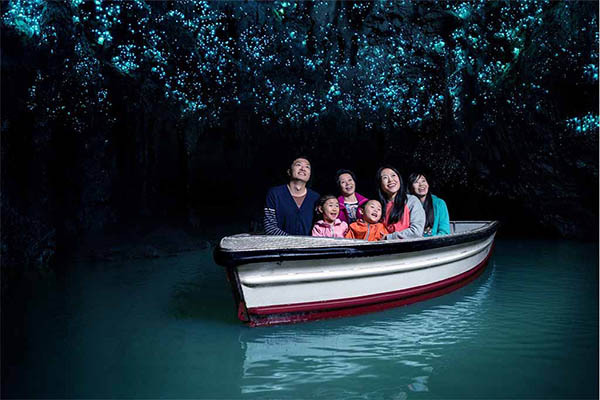 Or take a boat ride through the glowworm grotto and marvel at the twinkling lights from thousands of tiny glowworms. For the more adventurous, there are sinkholes and a labyrinth of rivers for caving and blackwater rafting. Carry on to Matamata that evening and enjoy a farmstay – another very 'kiwi' experience! Matamata is home to Hobbiton Movie Set, a must-do for all Lord of the Rings fans. You can explore all 44 hobbit holes including Bag End (Bilbo’s house), the famous Party Tree and Green Dragon Inn. Before leaving Hobbiton for Rotorua, you can visit Wairere Falls, the North Island’s highest falls (153m) with a beautiful outlook. Matamata to Rotorua is an hour’s drive. Once in town, head to Polynesian Spa and soak in a natural hot pool. The family pool that is ideal for the whole family - an awesome way to end the day. Today you’ll experience the thrill of flying high above emerald forests in a 3 - 3.5 hour zipline adventure. Led by the awesome guides of Rotorua Canopy Tours in a treasured piece of native forest at the Dansey Road Scenic Reserve, just 10 minutes out of central Rotorua. This experience has gained a 'must-do' reputation very quickly because of its epic nature and fantastic guides. Not only will you be flying over gigantic, ancient trees, you’ll also learn about the flora and fauna. Even more, you'll find out about our conservation project that you're helping to support by coming on tour. Spend the afternoon at one of Rotorua’s geothermal parks, gazing in wonder at geysers, bubbling mud and beautifully-coloured sulphur pools. In the morning head to Whakarewarewa Forest, locally called "The Redwoods", for more bush walks or mountain biking. The forest features epic trails for riders of all abilities. If you’re after something more relaxing, head to Rainbow Springs. This animal conservation park let's you get up close to New Zealand’s endangered species like the Tuatara and kiwi.